Big girl started dance team last week. She was so excited to see all her friends. Last night at class while practicing some leaps she landed with a thud. Her foot was hurt. She iced it a few minutes and tried to rejoin class. It was soon apparent she wouldn't be leaping anymore that day. When she was still swollen and complaining this morning I decided to bring her in to the doctor. Off to x-ray! Had fun driving (and crashing into things in her new wheels. Long story short...dance career is on hold. 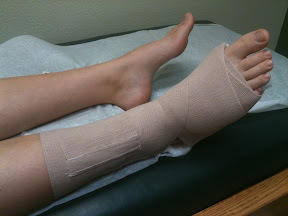 5th metatarsal fracture. Temporary splint. 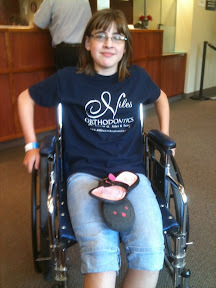 Going to orthopedist next week to see if it needs to be braced or casted. 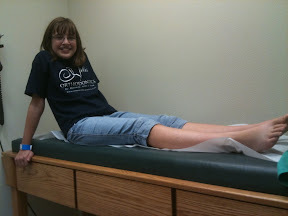 Only Big Girl can giggle her way through treatment for a broken foot!